Despite being a no-nonsense agent, Peggy Carter exudes glamour, from her 1940s pin curls to that chic red fedora. Emmy Award-winning Costume Designer Giovanna "Gigi" Ottobre-Melton created a stunning wardrobe of looks for Peggy, ranging from smart business suits for the office to elegant evening gowns for undercover assignments. Each week, Gigi will share the inside scoop on the looks behind the most stylish new show on T.V., Marvel's Agent Carter. Marvel's Agent Carter Costume Designer Gigi Ottobre-Melton. I spent much of my childhood at my father's Beverly Hills atelier learning first-hand the feel of luxurious European fabrics, how to sketch, and what the latest runway trends were. I studied design at the Fashion Institute of Design and Merchandising (FIDM) in Los Angeles. After graduating, I opened a couture studio in West Hollywood, where I designed gowns for the Royal Saudi family, fantasy wedding dresses, as well as custom work for film and television. Within a few years I traded the couture studio to fulfill my dream of fulltime costume design work, and never looked back. I've worked on several television series, and won an Emmy for costume design on the series Providence. When I heard about Agent Carter as a series, I was a very excited at the thought of designing for a b female undercover agent set in post-war New York. The era was a challenging time for women trying to work in the men's world. I loved Peggy Carter in Captain America: The First Avenger, and knew this was going to be a great series. Having the miniseries Mob City under my belt, I felt entrenched in the era. I had spent many months researching and sourcing 1940s from one coast to the other for that project. Marvel's Agent Carter takes place in New York which has a different sophisticated style and look. So I starting adding to my bulging files a post-war New York look. After a hounding my agent daily, I finally landed an interview. After reading the fantastic first script, my head was flooded with ideas, and I started sketching immediately. With great passion for the script, luck, and with fingers crossed, I got the job. The range of 1940s fashion is on display in this diner scene from the premiere. What draws you to this time period? The beautiful clothing style of the 1940s era have always fascinated me. Fabric was rationed during the war, so people learned to make do with less. Creative details using minimal fabric brought forth some beautiful designs. Over the years, I have collected several pieces. The 1940s style was very glamorous. The suits had wider lapels, shoulder pads and very high-waited pants. Men's ties were short and wide, many with bold prints. For the women, the large shoulder pads and nipped waistlines gave them the perfect hourglass shape. Skirts were knee-length in the early half of the 1940s, and then hemlines dropped to mid-calf post-war 1947. When working on projects from this period, the men on the set always comment on how beautiful all the women look. Today many of the club dresses are cheap, short, tight knits that reveal every body flaw a woman can have, from back fat and bellies to chubby thighs and knees. These kind of stretch dresses do nothing to compliment a figure. The dresses of the 1940s were designed to compliment the body. Agent Carter goes undercover in the premiere, channeling a Veronica Lake look. What was the biggest challenge of this series? As the viewers will see, the scope of the show is quite large, with lots of action. Constructing costumes in this kind of quantity for every episode has been a challenge. Sourcing fabrics with the feel and texture of the 1940s fabrics, but enough quantity to construct four, five, or more of the same costume has kept me on my toes. Sometimes we have only a day or two to create the costumes when the actors aren't available. I would like to give much thanks to my costume team who work side by side with me to bring the final look to camera. Peggy walks into a trap in the Marvel's Agent Carter premiere. Catch up on the premiere and tune in Tuesday JAN 13 9|8c for the next episode of Marvel's Agent Carter. 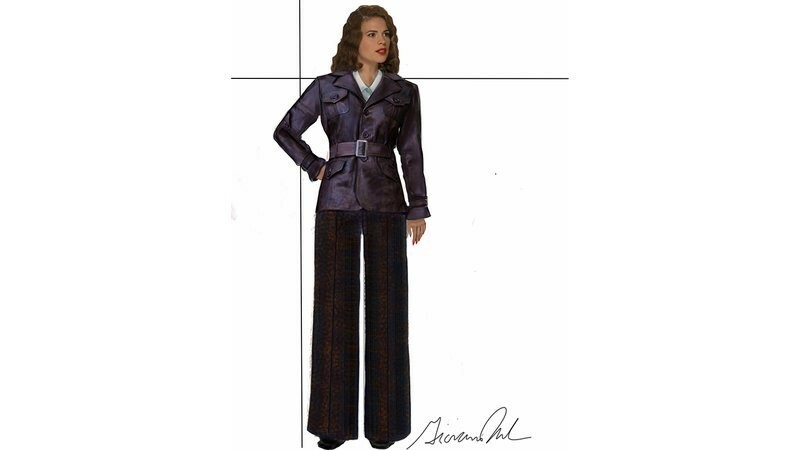 Plus, come back each week for Gigi's behind the scenes look at the incredible fashion of Marvel's Agent Carter.